I am a retired geologist now living in Rochester, New York. My hobbies include gardening, mineral and fossil collecting, and stamp collecting. Note: if you are viewing on an Ipad, both the Menu Items and the tags from the left sidebar have been moved to the bottom of the page, you must scroll all the way to the bottom to find them. Truly, a nuisance, but I have not found a work-around. New York is rich in mineral and fossil collecting sites. Many have been known for a hundred years or more, but others are being found every year. One purpose of this site is to capture personal knowledge of sites I have visited, and others that I would like to visit. This input may include maps, field pictures, mineral photos, and literature references. It is not meant to be complete in any category, and I intend to continually add to the site as I explore New York geology and minerals. Fred, I lost my main computer so this is a back up that I’m using until the thing is restored. I lost your e-mail address in the process. Coming to Rochester with Isaac on Thurs and Friday next week. Fishing on one of those days. Any rock trips goin on duing that time? Any chance of getting permission to wander up the ammonite site? maybe on Saturday? Ken, I just now noticed your message here. A few days to late to be of any value, but you did find my e-mail address so I guess we did communicate. Hope your trip to Rochester and your time on Lake Ontario was fun. I’m off to Buffalo Saturday for the BGS picnic. Long time no see. Very nice website. I am from Central Arkansas and in NY for a few months for work (March – June) and am looking for a couple spots to poke around on weekends. Not necessarily looking for a full on dig, but places were I may find exposed minerals, fossils, etc. to take home as “souvenirs” from my trip. Every time I ask the Google, your name seems to be at the top of the page, so, I was hoping you may could provide some suggestion for an amateur “rock dork” like me. Any suggestions or direction would be greatly appreciated. Sorry I did not check my comments recently. Penfield Quarry has an Open House on May 5th in the morning. Check wcgmc.org for details. Penn-Dixie fossil site near Buffalo is an excellent public site for Devonian Fossils of the region (there is a fee there, check their webpage for details). 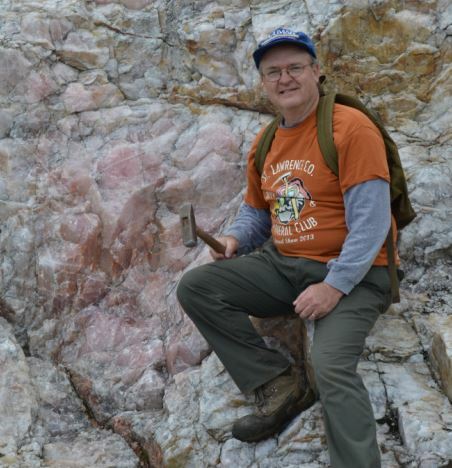 I can also recommend that if you just want a few local rocks/fossils and don’t want to dig for them, the club I am most active with is hosting a mineral show in Canandaigua June 2-3 (called GemFest) and you can check that our on the website listed above also. We’ll have lots of the local stuff available at very discounted prices (almost, but not quite giveaways. Finally, some of the beaches along Lake Ontario are strewn with interesting rocks. My favorite is the east side of Chimney Bluffs State Park. Lots of variety including garnet gneiss, and fossilized limestone, all courtesy of past glaciation. Hope you enjoy your time in NY. Fred – I am visiting family in Rochester in July and I have heard about the blue calcite and unakite from the Valentine quarry. I would like more information – I have heard that there is areas where they dump stuff that people could get to and collect. I want to collect some for myself but mainly for our mineral show silent auction and for kids activities. Just visit there entrance, which is a couple hundred feet down Hermitage Rd. off of Rte 3 in Harrisville. Just to the right side of the gate they maintain a pile of rock which contains blue calcite and weollastonite, and to a lesser amount, unakite. There is sometimes a bit of greenish massive prehnite. If you are there during working hours I’m sure you could go visit someone in the office, but they are fine with you just parking outside the gate and taking from the pile. The blue calcite is excellent for the kids. The wollastonite is kind of sharp and is probably best left for adults to handle. I’ve had needle-like splinters in my hand at times. Also, look for the grey-black blebs in the blue calcite. It is graphite. Enjoy your visit. A fellow bird and mineral lover, please let me know how to join your email list. I live on Becket/Chester MA line and am happy to host a small excursion. Michelle, A bit of a coincidence here. A bunch of us from WCGMC were in western MA last weekend. One place we went was the Chester Emery Mine right there in your home tomwn. Andrew Brodeur helped us at the site. He is in the Connecticut Valley Mineral Club. If you are not a member you should check them out. Hi Fred. I am a member of the Keene (NH) Mineral Club and we are always looking for new sites to visit. Right now I am looking for some places to visit in the St. Lawrence County area. I read about your club’s four day foray into the “north country” with a great deal of interest, and wondered if you could help me plan a trip similar to yours. In exchange, please let me know if your club is interested in digging in the Chickering Mine in Walpole, NH – I have access to the site and the cabin, and we could probably arrange to have your club stay there for a small fee per person. Elaine, I do not check my comments on this blog often enough and so I miss many I should be more prompt in responding to. Maybe it is too late to help you out for this year, but perhaps we can do something next year. Our club has been to NH once recently in 2017 (jointly with Burlington to visit Palermo and then we went on to Moat Mtn. ), but a trip to other locations might be nice. As for St. Lawrence County I can help you with info on Rose Road, Powers Farm and Bush Farm (all fee sites on private land) and with a couple other roadcut sites. We visit a couple quarries also when they let us, but those permissions have been extra hard this year for the local clubs as one quarry changed ownership and another said they were too busy with operations (we plan to call them again in the fall, but …). You can reach me at [email protected] more reliably and also check out trips Wayne County is holding at wwww.wcgmc,org. Thank you for your comments and photos on the variety of stones on the shores of Lake Ontario. I am quite stumped in telling my fellow club members just what it is I have collected. Also retired, I moved from this area to Florida – the rockless state!! – but return annually especially to get some of the gneiss and granite “pebbles” for cabbing from the shoreline beach in Oswego (for nostalgia, I had some cabs of these stones set into the sun ledge in my pool)—and I just realized the road we come down was Fred Haynes Blvd! Now, there must be some story to this?? Thanks Fred! I know that road near Oswego, but I can assure you it has nothing to do with me. I retired to this area 6 years ago and have no previous history here. When I saw it I thoguht I should investigate, but I never have. How wonderful! I just left a reply to one of your posts on Stromatolites and just now saw that you live in Rochester NY – so do I (Macedon, actually). Howdy neighbor! If collecting trips interest you, then you might want to look into the Wayne County Club. Visit wcgmc.org for details, I edit the newsletters that are all available on that website also. FYI, the club just went to Herkimer last Saturday, likely the final time for 2018. Thank you so much for creating and maintaining this blog. It is super informative and an excellent introduction to rockhounding. My prior experiences only include collecting fossilized shark teeth in the Chesapeake Bay, finding some fossils on James River in Virginia and hunting for Herkimers. I am really hoping to expand my experiences and collection further. I would love to eventually participate in some of your amazing club’s quarry visits! Please do continue your blog posts! Zach, I just saw this here. Thanks for contacting me elsewhere. I don’t check the comments here as often as I should. Hope to see you at a WCGMC meeting this winter. Hi great article and information, also thanks for all the mining spots in ny had no idea there were so many. I live by fort drum, so it’s nice to know there some many just hours away. These concretions you mentioned from Massachusetts are very cool I think I’ve found these on the Indian river some of them have natural holes in them. I wish I could add a picture. Just wanted to confirm it. Also I know a great place to find labradorite in ny if you’re interested! Thanks for everything! Glad you enjoy some of the notes I’ve posted. Yes, the glacial concretions can have holes in them. Those probably started to grow around leaves which had holes in them before getting buried. I’ve looked for and found some labradorite at a few locations in the Adirondacks, but have yet to find a truly great piece. The sites I’ve visited are around Keene and Ausmus as I recall, all along rivers and small rocky streams.